NCLE, which is a coalition of literacy organizations that includes the American Association of School Librarians, the International Reading Association, National Council of Teachers of English, and others, conducted a national survey of over 3,000 teachers to learn about their preparation and confidence related to implementing the Common Core State Standards (CCSS). Whether or not you teach in a CCSS state, the findings of this survey should be of interest to everyone in the field of education. Every state, district, and school in the U.S. is placing an increased emphasis on raising the rigor in literacy teaching and learning. There are many leadership opportunities for school librarians in these findings. • Nationwide, teachers feel ill-prepared to help their students achieve the new literacy standards (NCLE). I believe that all educators feel challenged to teach literacy skills. We know students need to master traditional literacy skills as well as 21st-century skills. This is a tall order when many children do not arrive at school with rich literacy backgrounds, need on-going support for applying reading comprehension strategies across genres, content areas, and grade levels and need to learn how to effectively use technology tools to interact with information and produce knowledge. This is a tall order. Who can help? A 21st-century school librarian! • Working with peers is the most valued support for standards implementation (NCLE). As a long-time collaborating librarian, this finding does not surprise me. 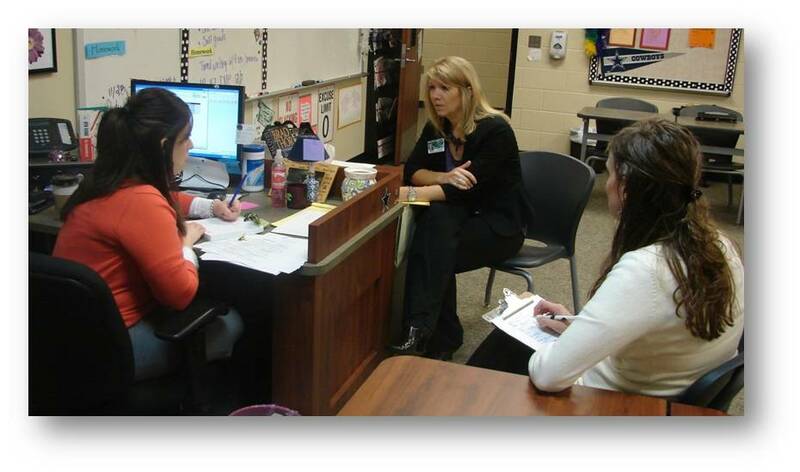 I know that my colleagues and I have benefited tremendously through coteaching. The extra challenge for classroom teachers is that it is difficult for them to work with one another during the school day in order to achieve true job-embedded professional development. If educators combine classes, they have twice as many students whose needs they must meet. And few administrators have the flexibility to release teachers from their primary teaching responsibility so they can coteach with their peers. Who can help? A 21st-century school librarian who can coplan and coteach with classroom teachers in real-time, with real students, real curriculum, real resources, real supports, and constraints of the actual teaching environment can be the peer with whom classroom teachers work. Through coteaching, we can help classroom teachers meet their need for standard-based lesson implementation and improve our literacy teaching practices together. • Time for working together in schools is decreasing (NCLE). This is an ill-advised situation that school-level and district-level administrators should pay attention to and address. When new standards or initiatives are introduced into a learning community, educators need to break out of the isolation of their classrooms, labs, and libraries in order to ensure that innovations spread throughout the learning community. Who can help? 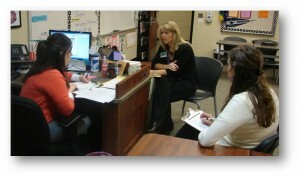 A 21st-century school librarian has expertise in using technology tools for asynchronous collaboration. Using Google Drive docs, wikis, and other Web 2.0 tools to conduct collaborative planning can provide effective venues for working together when face-to-face time is short or not readily available. On Thursday, I will respond to some of the additional findings of this important data from the field. “Remodeling Literacy Learning Together: Paths to Standards Implementation.” Literacy in Learning Exchange. 18 Feb. 2014. Web. 31 Mar. 2014. <http://www.literacyinlearningexchange.org/remodeling-together>. Looking for some cool tools in your classroom? 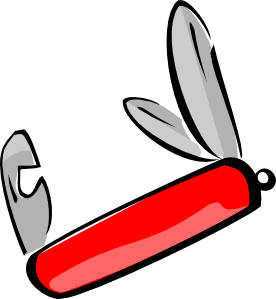 Think about the utilitarian roles of the teacher librarian-think Swiss army knife. That’s how one teacher describes the impact of the teacher librarian in schools. In a recent blog post on Edutopia, Josh Work, a middle school teacher from Maryland, shares his take on collaboration that is at the heart of his daily practice in his school. That collaboration in teaching and learning is with the teacher librarian. This blog is a must read for all of us who strive every day to become embedded in the educational fabric of schools as teacher librarians/media specialists. From Josh’s experience, he sees the teacher librarian as a leader in the implementation of the Common Core State Standards and technology integration. As in many cases, the collaboration began in simple ways, with a quick face to face conversation that grew over time to brief meetings, and then later to include co-planning and co-teaching curriculum. He also goes on to give some advice to other teachers about enlisting help from the building media specialist/teacher librarian. Whether or not the Swiss army knife is an image you have of yourself, it’s great to learn about successful collaborations with teachers from another perspective. In fact, the metaphor does represent the multiple facets of our morphing role, so let’s embrace it. Hearing from colleagues such as Josh who understand and appreciate the expertise and knowledge that we provide, is refreshing, and affirms the work that we do. It also gives us incentive to try harder, even in the face of budget cuts and increasing demands on teachers’ time. Together, we all can make the shift in instructional design and practice if we continue to embrace partnerships to meet the challenges of teaching and learning in today’s world. Thank you, Josh, from the bottom of our hearts. 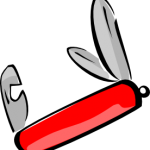 We think you are sharp, too! Last week I followed along on my own PLN with the great things that school librarians were doing for Teen Tech Week 2014. The theme of DIY @your library promoted the library as place to extend learning beyond the classroom for teens. It was great to see was how it facilitated differing partnerships between school librarians and teachers, students, parents, community, and the public library. One example that really struck home with me was Norcross High School, where Buffy Hamilton and her colleagues provided a week of digital delights, both low and high tech, to engage many types of teens. You only have to watch a minute of the videos she posted to see students engaged in creative play to learn. They were there during their lunchtime to enjoy collaborative time with their peers, as well as learn along with their excellent school librarians. 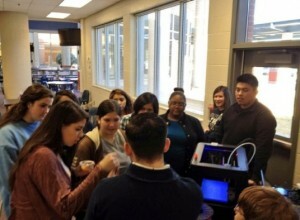 As a finale for Teen Tech Week and a kickoff for their partnership with Gwinnett Public Library, members of the public library team brought over a 3D printer to share with the students. It was amazing to see the excitement and awe on these students’ faces and the thoughtful reflections they shared. Not only did the group of students coming to the library for Teen Tech week activities increase throughout the week, but also I am guessing that the word is getting out about the cool things going on in the library. This is going to be a partnership to watch in the future for great things to come. Often school librarians question how to enact the technology leadership role in practice – this is a great example! This list of information literacy strategies is also a list of reading comprehension strategies. It is not surprising, then, that when school librarians and classroom teachers collaborate for instruction, students’ reading proficiency improves. When classroom teachers, school librarians, and principals work together, students benefit. Classroom-library collaboration for instruction is a win-win-win-win opportunity – Collaborating, Communicating, Critical Thinking, and Creativity – for all.